This is the second installment in a series of responses to comments made by Rev. Juan Valdes in the debate and in his post-debate webpost responses. In my last post, I refuted his contention that Genesis 1:1-3 does not speak of water as the primeval substance that pre-existed light, the earth, the sky, and all heavenly bodies. In this post, I concentrate on showing that biblical authors believed that the sky was a solid structure, probably metallic, in which the stars, moon, and sun are embedded. If so, that certainly does not accord with our observations of how the universe is structured. His relevant webpost is here. RETREAT ON TRANSLATION TRUSTWORTHINESS One good sign of progress in this debate is that Rev. Valdes has dramatically revised his view of translations. So, while he previously believed that translators were “trustworthy in their rendering of the original text,” he now has had the revelation that translations are not always trustworthy "in their rendering of the original text". Instead, he lapses back into a well-known apologetic technique of saying that only the “autographs” (the original writings made by the very hand of the human authors), are trustworthy. These autographs are not available to us, and so he cannot possibly demonstrate anything he claims for them. By Rev. Valdes’ logic, we also can posit that any non-Christian writing he thinks is defective actually did have a perfect autograph that we can trust. It does not matter if we cannot now observe that perfect autograph. It must have been perfect. GENESIS 1:6-8 "And God said, 'Let there be a firmament [RAQI’A] in the midst of the waters, and let it separate the waters from the waters.' And God made the firmament [RAQI’A] and separated the waters which were under the firmament [RAQI’A] from the waters which were above the firmament [RAQI’A]. And it was so. And God called the firmament [RAQI’A] Heaven." GENESIS 1:14-17 "And God said, 'Let there be lights in the firmament [RAQI’A] of the heavens to separate the day from the night; and let them be for signs and for seasons and for days and years, and let them be lights in the firmament [RAQI’A] of the heavens to give light upon the earth.' And it was so. And God made the two great lights, the greater light to rule the day, and the lesser light to rule the night; he made the stars also. And God set them in the firmament [RAQI’A] of the heavens to give light upon the earth, to rule over the day and over the night, and to separate the light from the darkness." GENESIS 1:20 “And God said, ‘Let the waters bring forth swarms of living creatures, and let birds fly above the earth across the firmament [RAQI’A] of the heavens.’"
The word “firmament” correctly reflects the solidity of the sky envisioned in the Hebrew Bible, and that understanding reaches back into pre-Christian times in translations. First, Rev. Valdes leaves unexplained how he can possibly do this without sufficient knowledge of Hebrew that he admits he does not possess. For now, I will ignore the more difficult time he would have explaining logically and empirically how he knows what meaning God intended. Second, and despite telling us that the preferred method is one that involves examining “the original language, not other translations”, he proceeds to tabulate some 40 translations in his webpost response. While the tabulations are useful in showing that there is a difference of opinion among translators, Rev. Valdes ultimately fails in telling us why he thinks any translation is better on the basis of “the original language” as he promised to do. I will explain why such explanations are both logically and empirically unsound and circular. Since his own post is titled “What is the scientific evidence that the sky is solid?,” then he should provide scientific and linguistic evidence, not theological dogma to support his argument. C. An arbitrary selection of translations he believes are correct, but which he cannot independently evaluate to be correct. D. A misrepresentation of some of the translations and scholarship he says support an open sky understanding of RAQI’A. This is a misrepresentation of my position. I did not say that “firmament” or the prefix “firm” is “sufficient evidence that the word is referring to a solid or hard dome,” if that means I think that the use of the English word "firmament" alone proves that RAQI'A is solid. He never quotes me directly to that effect either. What I have suggested is that most people today don’t realize that the modern English word “firmament” is reflecting a solid understanding of RAQI’A by the translations that use it. He, too, must agree because he states: “Second, the word ‘firmament’ should never have found itself in any translation.” He himself places translations with “firmament” into the group of translations that favor a solid dome. There are at least two basic procedures for establishing the meaning of words in any ancient language (see also Hartmann; Mettinger). (A) Contrastive expressions involving the word in question (e.g., if an ancient author says: “I mean X, not Y”). (B) Translations into other languages. Translations are crucial to establishing the meaning of ancient languages. For example, the reason the Rosetta Stone proved invaluable in understanding the Egyptian hieroglyphic language is that it had a translation into Greek. So, while evidence must be carefully weighed and biases are always a problem in translations, the latter still can be very important in helping us understand biblical Hebrew. Any biblical Hebrew dictionary frequently uses cognates and translations from other languages to help elucidate the meaning of any particular Hebrew word. A. The RAQI’A is meant to separate waters below from waters above it, which would be accomplished by a solid structure. When it rains at the beginning of Noah’s Flood there are references to windows (Genesis 7:11) that are opened, and that also suggests a solid structure. In the Enuma elish (Tablet 4, lines 137-140), sometimes called the Babylonian Genesis, it is stated that Marduk also created the sky out of the waters. “He split her open like a mussel (?) into two (parts). Half of her he set in place and formed the sky (therewith) as a roof. He fixed the crossbar (and) posted guards; He commanded them not to let her waters escape” (Heidel, The Babylonian Genesis, p. 42). Note how in both narratives the sky is created to control water, and that in both narratives the sky is taken out of water as in Genesis 1:6: “Let there be a firmament in the midst of the waters [יהי רקיע בתוך המים] , and let it separate the waters from the waters" (RSV). B. The Sun, moon, and stars are SET IN (Hebrew preposition: ב) the RAQI’A (1:14, 15, 17). A form of the Hebrew verb נתן (NATAN), translated to “set” in Genesis 1:17, is also used when thrusting something into an object, as in Deut. 15:17: “Then you shall take an awl and thrust [נתן root] it through his earlobe into the door, and he shall be your slave forever” (RSV). Setting heavenly bodies in a solid structure made perfect sense in the ancient world. Before the advent of modern observational tools, people would have observed that ALL the stars (excepting the sun, moon, and planets) move TOGETHER as the night elapsed. That was precisely why many ancient astronomers thought that the stars must be fixed into a solid matrix (see further, Wright, Cosmology in Antiquity, especially pp. 146-147). 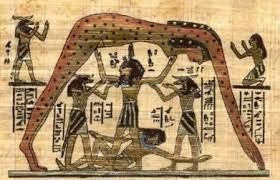 We have a number of Near Eastern illustrations of this concept, including one shown here from Egypt. This switch at verse 20 is perfectly consistent with the idea that birds cannot fly IN a solid, but can fly against it or “across” that RAQI’A, or more literally, in "front of" or "in the face of" the RAQI'A. ‘AL-PENEY” is better translated as “in the face of” or “in front of” or “across from” depending on the verb of motion where it occurs. For example, Deut. 32:49: “Go up into the Abarim Range to Mount Nebo in Moab, across [‘Al-PENEY] from Jericho” in the NIV. Clearly, Mount Nebo is NOT IN Jericho, which is across the river from Moab. Rev. Valdes neglects the occurrences of RAQI’A in Ezekiel, where it is even clearer that the RAQI’A is a solid structure. Here are two important passages that demonstrate the solidity of the RAQI’A. Notice that the RAQI’A is apparently able to support a throne of gemstones (sapphire = Hebrew ספיר), and that the RAQI’A itself is a crystalline material, which is consistent with gemstones or some other solid like ice. The idea of that the heavens were made of gemstones, including blue stones such as sapphire or lapis lazuli, is also found in Mesopotamian texts (see, Horowitz, Mesopotamian Cosmic Geography, p. 9). Some creationists respond that it says “like crystal” (כעין הקרח) in Ezekiel 1:22. So, it suggests that the structure is not made of crystal (so, Younker and Davidson, p. 140; they offer one of the best linguistic defenses, even if flawed, of a non-solid understanding). For example in Ezekiel 1:5 (RSV): “And from the midst of it came the likeness [דמות] of four living creatures” means that Ezekiel saw 4 living creatures, not just something that looked like 4 living creatures. The idea that God sits on a throne on a floor or throne of sapphire is also found in Exodus 24:10: “and they saw the God of Israel; and there was under his feet as it were a pavement of sapphire stone [ספיר] like the very heaven for clearness” (RSV). In both Ezekiel 1:26 and Exodus 24:10, The King James Version also has “sapphire stone” which is consistently representing the same Hebrew word: ספיר. 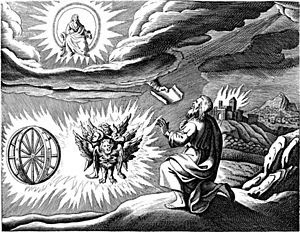 If one understands that God is supported by a pavement made of sapphire in Exodus 24:10, then it is perfectly reasonable to understand Ezekiel 1:22, 26 to be describing a RAQI’A made of something solid because it seems to have the same function as the stone floor in Exodus 24:10: supporting the throne of God or constituting the floor of heaven. If conceiving of heaven as containing stone structures is mythological when the Egyptians speak of it, then why is it not mythological in the Bible? The fact is that the Septuagint may just as well be representing older and authentic Hebrew traditions of the material constituting the sky, and not just importing Egyptian ideas. Rev. Valdes is correct in observing that I had the incorrect version recorded on the slide for this text. I had it as the RSV, when that is not correct. My oversight was the result of duplicating a previous slide that already had an RSV header, and not removing that header when adding the new translation, which should have been labeled as “my preferred rendition” as I did in the case of Genesis 1:1. A. The word תרקיע is a verb of the root רקע (RAQA’), which means “trample, hammer out/spread out” according to The Dictionary of Classical Hebrew 7:554. This verb is most often used in conjunction with beating out metal or working with metal (see Exodus 39:3, Numbers 16:38/Numbers 17:4 [Hebrew]). B. The use of מוצק (MUZAQ) reinforces that the material is metallic, as that is the word used for items made of molten metal. For example, in Job 28:2, the King James 2000 version has “and copper is smelted out of the ore” for the Hebrew ואבן יצוק נחושה. The word יצוק has the same root as מוצק in Job 37:18. The nominal form actually used in Job 37:18 can also be found in 1 Kings 7:37: "This is the way he made the ten stands [מוצק]. They were all cast in the same molds and were identical in size and shape" (NIV). These associations with metal are also why לשחקים is best translated as skies rather than clouds as some other translators prefer and which is linguistically possible. Here the King James Version also has “sky” not “clouds”: “Hast thou with him spread out the sky, which is strong, and as a molten looking glass?” The Hebrew word חזקים (root meaning "strong") is consistent with what we say of metals. C. Since it is metallic material, then “hammered out” is perfectly acceptable because it best describes how that material would have been “spread out.” Metal was usually beaten with a hammer or some other implement like a hammer. Rev. Valdes makes much of the English word “spread,” and erroneously assumes that it cannot be applied to metallic materials. That is incorrect. For example, the American King James Version applies the English verb “spread” to metal in Jeremiah 10:9. “Silver spread into plates is brought from Tarshish, and gold from Uphaz, the work of the workman, and of the hands of the founder: blue and purple is their clothing: they are all the work of cunning men” [My emphasis]. Thus, using the English word “spread” definitely does not refute a metallic understanding for RAQI’A by those English versions. 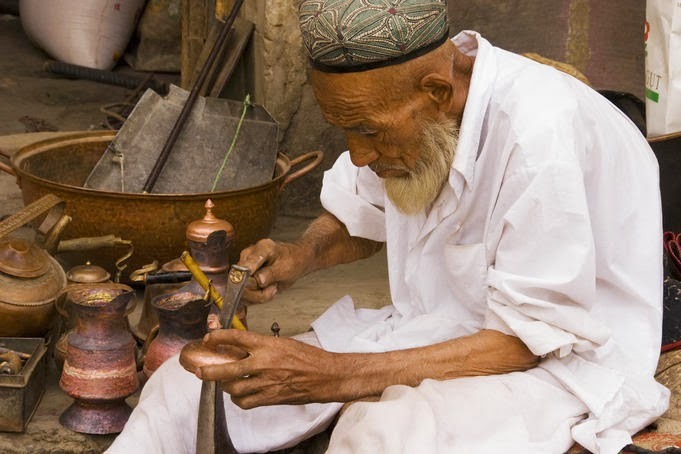 You can spread a RAQI’A made out of metal just like you can “spread” silver into plates. That is also why “hammer out” is better as it prevents that misunderstanding. If Rev. Valdes thinks that somehow speaking of spreading or stretching the heavens is less mythological, then he would be disappointed. Many other non-biblical creation stories also speak of stretching or spreading the heavens. This passage supports the idea that Hebrew authors did think that God constructed the RAQI’A with his hands, just like a metalsmith might do. Note that creationists usually have no problem believing that Yahweh took a rib from Adam (Genesis 2:21) to form a woman, and then closed up the wound, much like a surgeon working with his hands might also do. What creationists demonstrate yet again is that they don’t really believe what their Bibles say, and they deflect these passages to some “figurative” meaning when they have no reason to do so other than the would disagree with modern science. Do that with other ancient Near Eastern stories, and we can make them all agree with modern science just as well. THE SEPTUAGINT As Rev. Valdes acknowledges, the Septuagint, the collective name for the earliest Greek translations of the Hebrew Bible (ca 3rd century BCE and onward in Egypt), used STEREOMA to translate RAQI’A (see also Hengel; Kraus and Wooden on the complexity of what is called the “Septuagint”). More importantly, Rev. Valdes acknowledges that STEREOMA refers to a solid entity. This is significant because the translation was made by Jewish scholars who presumably understood Hebrew as it was understood in the Second Temple Period, which includes the time of Jesus. While it is true that these Jewish translators assimilated many concepts of their time, it still leaves unexplained how they could have misunderstood such a central Hebrew word that Rev. Valdes views as so clearly referring to an open sky. Rev. Valdes unwittingly undermines not only his view of RAQI’A, but also his entire theology of biblical inspiration. First, the Greek scriptures are actually the ones quoted by Jesus (at least, as he is portrayed doing in the New Testament), and by New Testament authors as their authority. Rev. Valdes claims that “God would not reveal to his people a mythological conception of creation.” So, he now would have to admit that Jesus and the New Testament writers use a version that, by his own admission, is influenced by pagan cosmology. Did Jesus not realize he was using such a tainted version? “It was virtually the only form of the Old Testament in the hands of Jewish believers outside Palestine, and it was certainly the only available form for Gentile coverts to the Jewish and Christian faiths” (Archer and Chirichigno, p. ix). Second, if the translators of the Septuagint can be contaminated by pagan cosmology, then what is the empirical evidence that the authors of Genesis could not be similarly contaminated? After all, the reason even evangelical scholars are convinced that the Septuagint is using pagan concepts is precisely because it is using vocabulary that is used by pagans in describing the universe. So, why can’t we conclude the same about Hebrew authors when they also use vocabulary and descriptions similar to other Near Eastern cultures when describing the cosmos? There is nothing but theological dogma to substantiate any difference Rev. Valdes is making between Genesis and mythology. 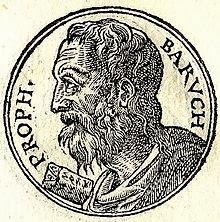 The work known as 3 Baruch shows that ancient Christians and Jews did believe that the sky was solid, as evidenced by this statement in 3 Baruch 3:7 concerning the builders of the Tower of Babel: “And taking an auger, they attempted to pierce the heaven, saying, ‘Let us see whether the heaven is (made) of clay, or copper, or iron” (Charlesworth, The Old Testament Pseudepigrapha 1:665). A. It is not representative of Christianity. B. It is not part of the Jewish or Christian canons. E. The wicked are turned into demons and punished as well. F. The author is believed to have been a Gnostic (and cites The Jewish Encyclopedia for evidence). Once we examine these objections, one can see how vacuously theological they are. Concerning A, Rev. Valdes offers us no empirical evidence that 3 Baruch was unrepresentative of Christianity. The whole argument is premised on the assumption that he knows what the “true” form of Christianity is, and that is a theological claim, not an empirical one. The scholarship of Baruch shows quite the opposite. H. Gaylord, a specialist in 3 Baruch, remarks: "The opening chapters of 3 Baruch are most closely bound to stories from the Book of Genesis, but these are expanded and reworked in a manner common to much of the literature of Second Temple Judaism” (Gaylord, in Charlesworth, The Old Testament Pseudepigrapha, 1:659). If the Septuagint, which believes in a solid sky, was being used by New Testament authors and by most Greek speaking Christians, then why would most or all Christians using the Septuagint not believe that the sky was solid? How would Christians reading the Septuagint know any differently if the only scriptures or the main scriptures they use display such a belief? And if New Testament authors and Christians using the Septuagint believed the word STEREOMA meant a solid sky in Genesis, then why would 3 Baruch be so unrepresentative of all the Christians and Jews using the Septuagint? “One might think that Marcion’s drastic truncation of Christian scripture to one abbreviated version of Luke and ten letters of Paul would deeply offend Christians of his day. Just the opposite was the case; It was incredibly popular. … Scholars estimate that the Marcionites were more numerous than any other Christian faction at the time” (Dungan, Constantine’s Bible, p. 44). In regard to B, Rev. Valdes offers only a theological dogma because he has no empirical evidence that the canon he accepts should be the true one or even representative of Christianity. In regard to C, I am not sure how belief in 5 heavens is any more lethal to canonicity than belief in 3 heavens as reflected in 2 Corinthians 12:2: “I know a man in Christ who fourteen years ago was caught up to the third heaven” (RSV). The notion of three heavens is also found in what Rev. Valdes would call “mythology” hundreds of years before we find it in the New Testament. For example, in the Mesopotamian series of exorcistic texts known as Bit Meseri one finds this statement: “I have purified the three heavens for you Lugalgirra: Those of Anu, those of Enlil, and those of Ea” (Horowitz, Mesopotamian Cosmic Geography, p. 8). So is 2 Corinthians just as mythological as 3 Baruch? As to D and E, these are no more lethal to the authority of 3 Baruch than any other belief 3 Baruch has. Indeed, Rev. Valdes cannot support the objection without further circular reasoning (e.g., the just cannot be transformed into birds because the just cannot be transformed into birds). One can see how arbitrary and irrational such distinctions are because there are no objective reasons that Rev. Valdes provides to make such distinctions. Regarding F, Rev. Valdes offers only more theological dogma because he cannot show, by any empirical evidence, that Gnostic beliefs about the universe are any less true than those of the biblical authors he accepts. The Jewish Encyclopedia also rejects the entire New Testament as canonical, but I don’t see Rev. Valdes citing that as an authority to reject the New Testament. Again, this is pure religious chauvinism, and nothing more. This paragraph contains a false statement. If one looks at my slide at 2:01:16 of the YouTube debate, I displayed this definition from Clines’ The Dictionary of Classical Hebrew: “firmament, expanse of the sky, vault of heaven, considered fixed above the earth” [underlined emphasis mine here; my PowerPoint also apparently doubled initial Hebrew consonants when interfacing with the projector, e.g.,RRAQI'A]. The fact is that he has misrepresented the translations that he claims believe in solid sky. By most counts, the word RAQI’A occurs 17 times in the Hebrew Bible. Rev. Valdes tabulates 40 translations and divides them into three groups as follows for Genesis 1:6-8, 14-15, 17 and 20. Yet, all of these can also support a solid understanding of RAQI’A when all seventeen occurrences he counts are studied. Note the translations of Ezekiel 1:22 [my underlined emphasis]. So, while these versions may see RAQI’A as non-solid in Genesis 1, they offer no reason why they are rendering it as such in Genesis, given that they understand some sort of solid structure ( “dome”, “platform,” “surface”) in Ezekiel 1:22. Apparently, in the case of RAQI’A, he does not wish to mention “the entire counsel of God’s word” when it does not favor his position or when it is clearly inconsistent with itself. As he did in the debate and in his webpost responses, Rev. Valdes insists that my interpretations are more the result of some atheistic worldview than of sound linguistic scholarship. However, this again only demonstrates how poorly read he is in evangelical biblical scholarship. The fact is that there are a number of evangelical scholars who have been saying the same thing for decades, if not longer. "Note: Dr. Thompson’s reference to ‘Harris, et al., 1980, 2:2218’ is footnoted in the original article as: Harris, R. Laird, Gleason Archer, Jr. and Bruce Waltke, eds. (1980), Theological Wordbook of the Old Testament (Chicago, IL: Moody)." When I consulted the well-known TWOT (Theological Wordbook of the Old Testament) to see what it actually says, it became clear that Rev. Valdes has not read this source directly. First, the number 2218 is not correct. TWOT numbers its entries, and entry 2218 is not for RAQI’A, but for another root that occurs on the same page (vol. 2, p. 862) where RAQI'A also is found. RAQI'A is under entry 2217, which began on the previous page. And, of course, we could just ask why Rev. Valdes thinks Thompson or TWOT are right? He does not tell us, and so this is simply another instance of the well-known fallacy of an appeal to authority. And does Rev. Valdes not realize that I can just cite evangelical authorities that favor my position? Note the remarks of Paul H. Seely (1991, p. 227). So does that make me correct? Of course, we could both trade authorities, but that is not what scholarship is about. Scholarship entails the ability to evaluate independently whether any authority is right or not. Rev. Valdes has admitted that he cannot do that when it comes to Hebrew linguistics. In any case, it appears that Rev. Valdes does not even consult a basic evangelical linguistic resource such as TWOT himself, and so he is not giving us any independent opinion on why he thinks that article in TWOT is correct. B. I believe that Marduk would not reveal to his people a mythological conception of creation. We can then interpret everything in the Enuma elish, where Marduk’s creative activities are detailed, in manner that allows us to harmonize it with modern science. Rev. Valdes cannot appeal to scripture to prove his case because he has not even shown that what he thinks is the word of God is actually the word of God. It is his say-so, and nothing more. Otherwise, he is just accepting the say-so of biblical authors, and that is no better than accepting the say-so of any other ancient author who might claim that he or she has received some special revelation. The fact that Rev. Valdes does not believe that heaven is a solid dome does not constitute evidence that biblical authors think the same as he does about heaven or about God. What biblical authors think about heaven can only be determined on the basis of their own words and descriptions, and those words and descriptions don’t differ in crucial aspects from what Rev. Valdes calls “myths” when other religions use them. C. “The perfect text was the original autographs inspired by God and written by servants of His choice.” Since we do not possess the original autographs, then this cannot be a conclusion based on empirical evidence or what he calls “observational” science. Nor is it reasonable to deduce perfection of some “original autographs” on the basis of imperfect texts some of which he even he admits have been contaminated by pagan mythology. As I have argued at greater length in The End of Biblical Studies, (especially pp. 68-72), the entire search for the “original” text of the Bible is both a failure and not even philosophically possible for most ancient texts. CONCLUSION Rev. Valdes has already signaled a significant retreat in his effort to prove the scientific validity of Genesis. Having told us that the (N)KJV was trustworthy because it was made by a team of scholars versed in Hebrew, he now has to admit that that the King James Version is among those that “favor a view of ‘raqia’ as a solid dome” just as I do. As mentioned, a solid structure is perfectly consistent with something that can hold water above it as Genesis 1:6-7 indicate the RAQI’ A is supposed to do. Ezekiel 1:22 and 26 have no problem seeing the RAQI’ A as something that is solid enough to hold a throne and that appears to be made out of gemstones or some sort of crystalline material. Job 37:18 seems to speak of a solid metallic sky as well, given the association of the verb RAQA’ with metal working, and the use of MUZAQ, which can be associated with molten metal. The perceived joint motion of the stars explains why ancient Hebrews would think that the stars are embedded into a solid matrix, and why Genesis 1:17 uses a form of the verb NATAN, which is used when speaking of fastening items into a solid as in Deut. 15:17. The English “spread” can clearly refer to hammering or beating out metal as in Jeremiah 10:9. Therefore, “spread” cannot be used, by itself, to argue that a particular version that uses that word prefers a non-solid understanding of RAQI’A. 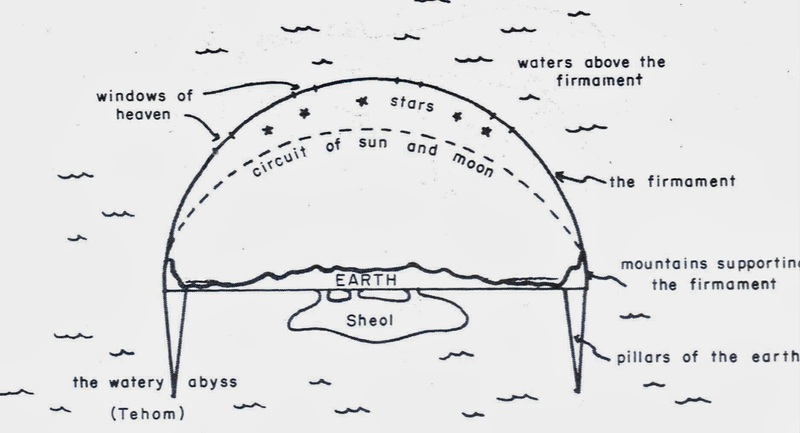 In the Enuma elish, the sky is described as a “roof” that also functions to control water, and in Egypt we see depictions of a domed structure with stars embedded in it, just as Genesis 1:16-17 describes for stars. The fact that Psalm 19:1 speaks of the RAQI’A being the product of God’s hands along with the clear associations of the verb RAQA’ with metalworking, shows that biblical authors described the construction of the sky pretty much like what we find elsewhere in the Near East. Just as importantly, Rev. Valdes now has been forced to admit that the Septuagint, which even fundamentalist stalwarts like Gleason Archer hold to be the only or primary scripture of early Christianity, also saw RAQI’A as a solid structure. Rev. Valdes attempts to say that a solid sky some sort of heretical notion that is not representative of early Christianity. Yet, Rev. Valdes has not explained how early Christians would know the sky is not solid if they are using a Greek version of the Bible that says that the sky is solid. Since the Latin Vulgate also has a similar understanding by using "firmamentum," then that means that most of Latin Christianity, which was the dominant form of Christianity until the Reformation, would have a similar understanding. What is actually absurd is that Rev. Valdes thinks that a solid understanding of the sky was so unrepresentative of Christianity given that most pre-Reformation Christians would be reading the Septuagint or Vulgate, which did have that understanding. The King James Version, by his own account, also has that understanding in Genesis. Despite tabulating 40 translations, Rev. could not tell us why, on the basis of the original languages, RAQI’A should be translated as an open sky or air in Genesis 1. He only asserts things like "X scholar is correct" or "X version is correct," etc. Once one sees that Genesis and the Enuma elish , among other creation stories, have similar views of the construction of the sky (e.g., out of water and to control water), then one sees that it is early Christians that simply continued authentic Hebrew conceptions of the universe. It is Rev. Valdes and modern creationists who are contradicting scripture. They don’t really believe what the Bible says. They, in fact, are the true unbelievers in what they call God's word. 1. Do The New Century Version, New Living Translation, NET Bible, and The Message support a non-solid understanding of RAQI’A in all passage where that word occurs in the Hebrew Bible? If not, then why did you not disclose that to readers? 2. How do you understand the material composition of the RAQI’A in Ezekiel 1:22 and 26? 3. Why should the material composition of the RAQI’A be different in Genesis 1:16-17 compared to Ezekiel 1:22 and 26 (and Exodus 24:10)? 4. If, as Gleason Archer admits, most Christians are using the Septuagint, which you say understands the sky to be solid, then why would most Christians reading that version understand the sky as not solid? 5. If most pre-Reformation Christians did understand the sky as solid because of Septuagint and Vulgate influence, then why would 3 Baruch be heretical or that different in that specific belief? 6. 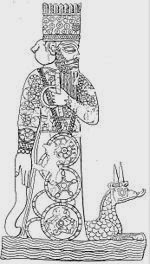 How is your corresponding claim about Yahweh different from this claim: “Marduk would not reveal to his people a mythological conception of creation”? 7. Given that the Enuma elish also says that the sky was taken from the water, and used to control water, then would you regard the Enuma elish just a scientifically valid as Genesis 1 in those specific beliefs? 8. Have you read Paul H. Seely’s work on RAQI’A? 9. If so, why specifically do you think TWOT is correct, and Seely incorrect as the meaning of RAQI’A? Please provide the specific arguments from TWOT itself, not through second-hand sources. REFERENCES Archer, Gleason and G. C. Chirichigno, The Old Testament Quotes in the New Testament: A Complete Survey (Chicago: Moody Press, 1983). Avalos, Hector, The End of Biblical Studies (Amherst, NY: Prometheus, 2007). Charlesworth, James. The Old Testament Pseudepigrapha (2 vols. ; Garden City, NY: Doubleday, 1983). Clines, D.J.A. (ed. ), Dictionary of Classical Hebrew (8 vols. ; Sheffield: Sheffield Phoenix Press, 1993–2011). Dungan, David L., Constantine’s Bible: Politics and the Making of the New Testament (Minneapolis: Fortress, 2007). Harris, R. Laird, Gleason L. Archer, and Bruce K. Waltke, Theological Wordbook of the Old Testament (2 vols. ; Chicago: Moody Press, 1980). Hartmann, R. R. K., ed. Lexicography: Principles and Practice (New York: Academic Press, 1983). Heidel, Alexander, The Babylonian Genesis (Chicago: University of Chicago, 1963 ). Hengel, Martin, The Septuagint as Christian Scripture: Its Prehistory and the Problem of its Canon (trans. Mark E. Biddle; Grand Rapids:MI: Baker, 2002). Horowitz, Wayne, Mesopotamian Cosmic Geography (Winona Lake, IN: Eisenbrauns, 1998). Kraus, Wolfgang and R. Glenn Wooden, eds., Septuagint Research: Issues and Challenges in the study of the Greek Jewish Scriptures (Atlanta: Society of Biblical Literature, 2006). Mettinger, Arthur, Aspects of Semantic Opposition in English (New York: Oxford Press, 1994). Seely, Paul H., "The Firmament and the Water Above: Part I: The Meaning of raqia’ in Gen 1:6-8,” Westminster Theological Journal 53 (1991):227-240. Wright, M. R., Cosmology in Antiquity (London: Routledge, 1995). Younker, Randall W., and Richard M. Davidson, “The Myth of the Solid Heavenly Dome: Another Look at the Hebrew רקיע (RAQÎA’),” Andrews University Seminary Studies 1 (2011): 125-147. *Unless noted otherwise, biblical quotations are from the Revised Standard Version.